Moth Control using pheromone lure showcase science in action. The female pheromone (or scent although we humans can't smell it) sends breeding age male pantry moths into a crazed search to find 'their girl'. Moth Lure Pheromones are exquisitely sensitive, and can be degrade by as much as the oils on your finger during the 5 seconds it takes to place the lure in the trap... For this reason we always recommend, tearing or cutting open the bait packet, but not removing the lure with your fingers. Instead after removing the protective film from the Able Catch Moth Trap drop the lure onto the bullseye without touching it.. How it lands, and even where it lands is not important. There is not a right-side-up, it will work in any orientation. Air flow also reduces pheromone life by a couple weeks, don't set the trap directly in-line with a fan or vent. 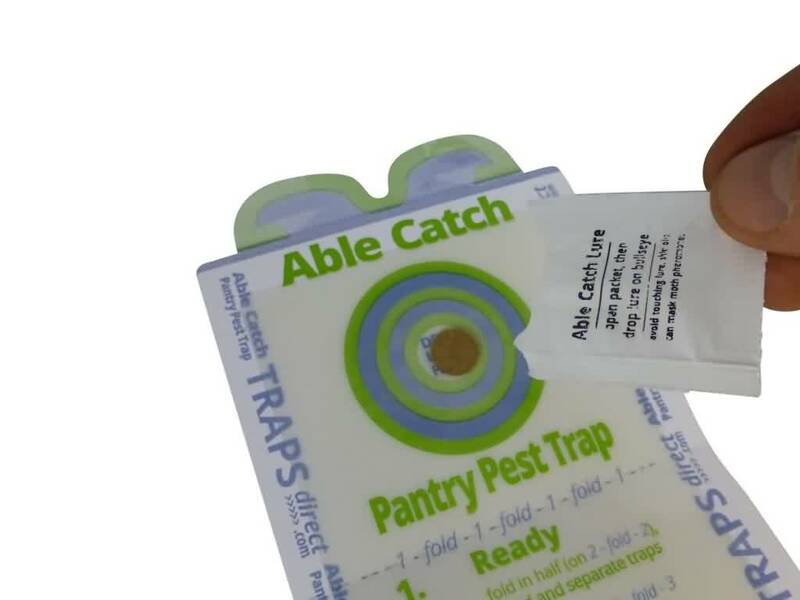 This entry was posted in Ask Traps Direct, Moth Trap Blog and tagged Able Catch Pantry Pest Trap, moth pheromone trap.